David Weinstock, MD, and Raymond Magner of Grove Medical Associates say EHR implementation is just the first step. LAS VEGAS — Online and mobile tools can improve not just patient engagement and health outcomes, but a physician practice’s bottom line. 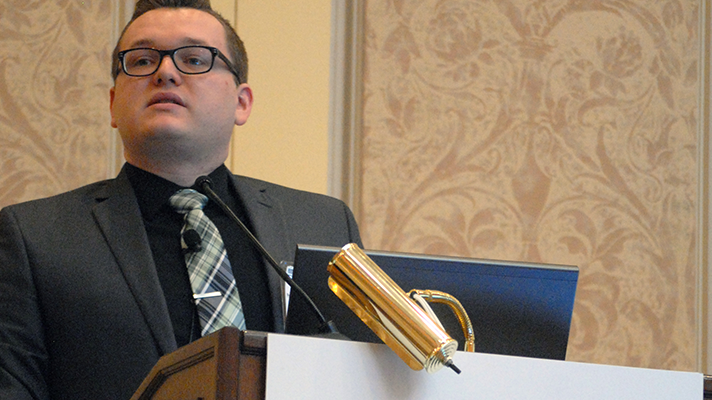 That was the message from David Weinstock, MD, and Raymond Magner of Grove Medical Associates in Auburn, Massachusetts, speaking about health technology at HIMSS16 on Wednesday in Las Vegas. Magner said the first step in developing an online wellness infrastructure is to implement an electronic health record system, the capabilities of which can be augmented by a patient portal. It allows patients access to their information 24/7, while creating comfortable and easy access with doctors, nurses and other staff. “It’s important for your patients to access their medical records online in a way that they feel comfortable with,” Magner said. Magner touted the comprehensive features of his own outfit’s patient portal, which allows patients to view lab results online, request referrals and prescription refills, cancel and schedule office appointments, and self-monitor certain aspects of their health, including glucose readings and blood pressure. Magner said Grove Medical noticed a significant increase in patient compliance, especially around preventative screenings. Paramount to this digital approach is the patient’s ability to choose his or her own method of communication, be it emails, text messages or app notifications, he said. They also have access to education related to a diagnosis and ongoing health tips relevant to their situation. In a patient satisfaction survey conducted in Massachusetts five years after the implementation of Grove Medical’s patient portal, the hospital scored higher than the state average. Weinstock said the investment in this technological approach has resulted in better patient health and also in solid financial returns. The hospital is also dabbling in wearable medical technologies that allow for real-time monitoring of vital health statistics. The facility spearheaded a 20-patient trial to determine the viability of Bluetooth-equipped wearable devices, tracking blood glucose, blood pressure and general activity. “As a primary care doctor, I certainly feel the need to know what’s out there,” said Weinstock. A point-of-entry push to get patients to use the portal has been a means toward that end. Which isn’t to say that everyone is responsive; some have been resistant, which Weinstock said will always be a challenge. But things are improving in that area, as well. This story is part of our ongoing coverage of the HIMSS16 conference. Follow our live blog for real-time updates, and visit Destination HIMSS16 for a full rundown of our reporting from the show. For a selection of some of the best social media posts of the show, visit our Trending at #HIMSS16 hub.